Amber is and was appreciated for its beauty and color for thousands of years. This substance is a fossilized resin, which comes from ancient trees. Resin is formed when trees exclude it through cuts and breaks. It is thought that trees produce this resin in order to protect themselves from diseases and enhance healing of broken branches; however there are different opinions about its purpose in plants. When this substance is released from the tree within time its starts to harden. In most cases excluded resin falls into the ground and stays buried near the base of tree where it hardens for many years. If this resin is younger than two thousand years it is quite commonly referred to as Copal. Copal is quite similar to true Amber; however it is still quite soft and not fully fossilized. Due to this jewelry makers prefer true Amber and not Copal. Even though Copal turns into Amber over time this process takes many thousands of years. Even though Amber comes in many different colors the most common one is yellow-honey. It is also worthwhile to mention that quite commonly Amber also contains insects or plants inside, which greatly increases its demand. This type of Amber is quite useful for scientists since it gives a hint about plants and insects that were living many thousand years ago. It is worthwhile to mention that Amber is not just a substance for making jewelry, but also it is thought to have thearapeutical and healing powers. These properties were known throughout history. In fact Greeks and Romans believed that Amber can not only promote health, but also that it has the capacity to draw misfortune and evil spirits away from the people. The main reason why it is thought that Amber has healing and health benefits is because it contains Succinic Acid. This acid is what provides Amber with healing, immunity enhancing, anti-inflammatory, stress and pain relief properties. The fact that absorbed Succinic Acid is beneficial for our health is proven by scientific research. 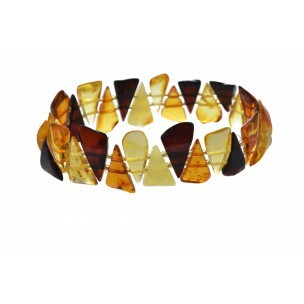 In case you are interested in Amber for its health benefits it is best to choose jewelry that is made from raw Amber. This is because raw Amber contains the highest amount of Succinite acid. When natural amber jewelry is close to the skin, created warmth helps to release succinic acid and then it is absorbed into our bloodstream. 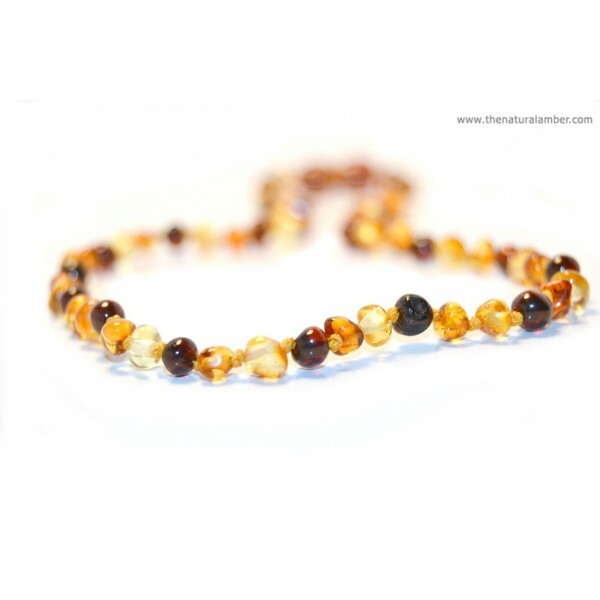 Amber necklace is a natural and popular remedy in Europe for teething babies. These teething necklaces can be worn by both girls and boys from 3 month age to 2 years age. This age is usually when teething begins and ends. When an infant wears this necklace it provides relief from pain and other symptoms associated with teething so you might not need stronger medications. Since this necklace is worn near the skin it makes amber warm, which causes oils to be released. This effect provides babies with benefits like calmness and relaxation. For safety reasons these necklaces are made in specific length (~32 cm) so that they wouldn't fit in baby's mouth. Even though these necklaces are generally safe to wear it is recommended to let your child wear it only when he/she is supervised in order to avoid any accidents. Necklaces made with Amber are becoming more and more popular way to protect your pets from ticks and fleas. The main reason why these necklaces thought to be effective is because Amber has a specific aroma. When a necklace is worn by pet amber becomes warm from the fur and it starts to release resinous smell. This scent is what helps to repel fleas and ticks from your pet. In addition to that Amber is also known to have electrostatic features. This means that when Amber is in contact with fur it will create static electricity, which is also beneficial for repelling fleas and ticks. It is worthwhile to mention that these necklaces are more effective when they are worn for longer time. On average it takes from 3 to 4 weeks to get full repelling benefits from these kinds of necklaces. Even though Amber necklaces take a bit longer to start working they are also completely natural and don't contain any chemicals. Babies and pets are not the only ones who can benefit from wearing Amber. Adults choose to wear jewelry made from this natural resin not only because they are beautiful and unique in appearance, but also because they can provide them with some health benefits. In case you are wearing amber for health purposes it is important to choose jewelry that would provide the most benefits for specific medical condition. If you want to get relief from pain in areas like neck, head and throat it is best to wear a necklace. In case you want to minimize pain of arthritis, joints or rheumatism it is best to choose a bracelet. Some additional benefits of wearing Amber jewelry for adults is that it can help minimize anxiety and eliminate fatigue. To get all of these mentioned benefits it is important to wear amber jewelry for as long as possible and so that it would be in contact with your skin for longer time. Since Amber is found in different locations of the world it is also quite commonly divided into types based on its location. Some of the most popular locations that mine Amber commercially are Dominican Republic and Baltic Sea country’s (Lithuania, Poland and Russia). Baltic Amber is usually 50 million years old and Dominican Amber is approximately 14-40 million years so the first type is much older. 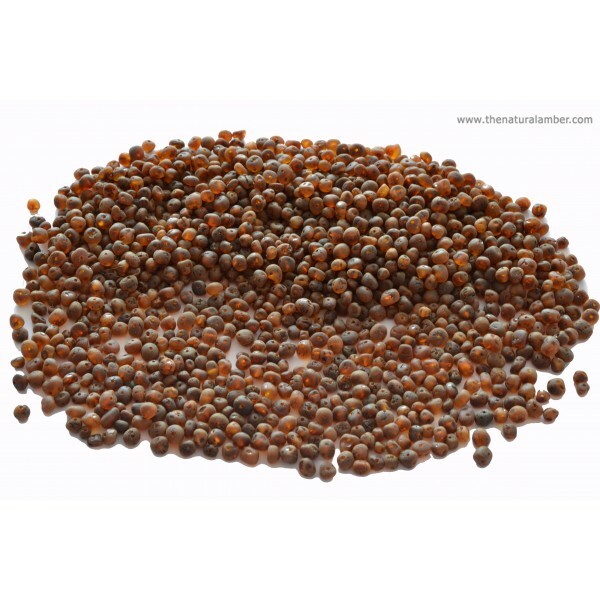 You should know that all jewelry and supplies that are offered in this website are made only from true and genuine Baltic Amber. When buying Amber or its jewelry it is important to pay attention to this substance origin. This is because there are quite a lot of plastic imitations and also you can end up purchasing Copal, which is only couple thousands of years.